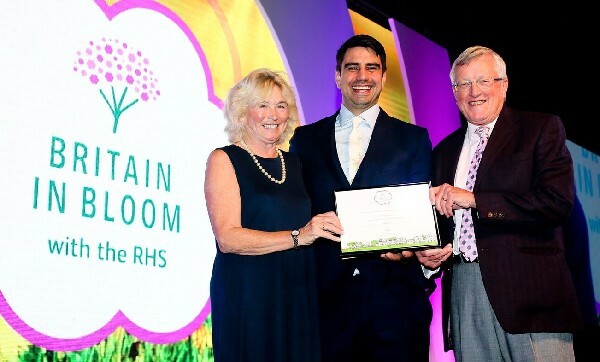 Photo: TV Presenter Chris Bavin (center) presenting the award to Wimborne in Bloom's Susie Gatrell and Chairman Richard Nunn. 19th Oct 2018 - The results are out ... The Town of Wimborne Minster was awarded a Silver Gilt Medal in the RHS Britain in Bloom UK Finals at the Awards Ceremony held in Belfast last Friday. The hosts included RHS President, Sir Nicholas Bacon, who gave an address whilst the Master of Ceremonies was James Alexander-Sinclair, garden designer, writer and broadcaster. Also present and involved was Chris Bavin, who presented the Britain in Bloom Series on BBC 2 in the summer and who is currently appearing on home economics series. There were eight other towns across the country competing with Wimborne in the Town Category and the winner was Linlithgow in Scotland. The comments contained in the judges report included the fact that they were particularly impressed with how clean the town was. They praised the efforts of the Wimborne in Bloom team of volunteers, well supported by local business and partners which makes a real difference to this beautiful Minster Town, the colourful displays complemented by sustainable planting makes it a delightful place to live and visit. Commenting, after return from Belfast, Chairman Richard Nunn expressed his very sincere thanks for the efforts and support of many in Wimborne which have been recognised by this nationally acclaimed award by the Royal Horticultural Society. Monday 30th July 2018: After a very wet and windy Sunday which took its toll on the hanging baskets and planters around town Monday dawned quieter as the two Britain in Bloom Judges arrived in Town. Mel Henley and Ruth Growney arrived at the Town Hall to be greeted by the Deputy Town Mayor Cllr Shane Bartlett, the Chairman of Wimborne in Bloom Richard Nunn and other Members of the Wimborne in Bloom Committee. 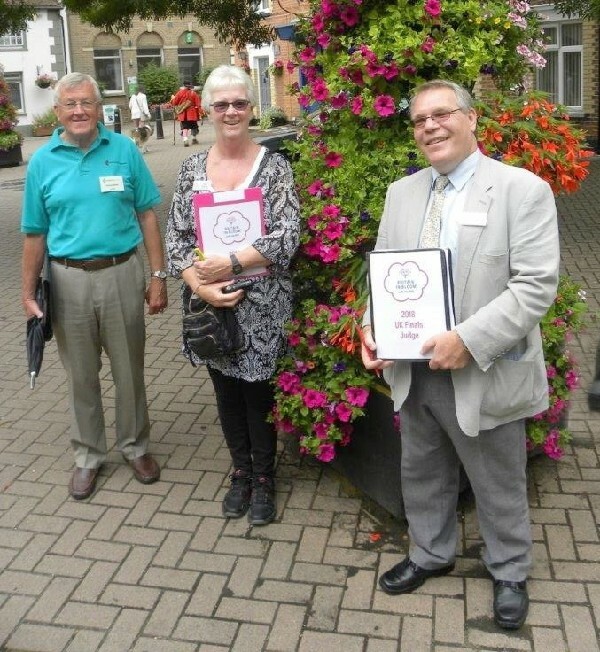 Following a presentation on Wimborne in Bloom the judges went on a two and a half hour tour of the Town. Everywhere was looking good, much of it thanks to more than 20 people who had turned up on Sunday evening to help with a litter pick and general tidy-up. The judges were shown the best the Town had to offer and followed much the same route as when the Town was judged in the Regional Competition just over a week previously. 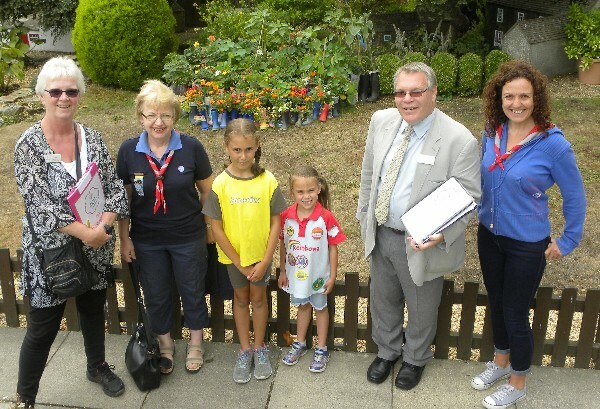 The Tour concluded at the Model Town where the judges met some of the North East Minster Girlguiding Members who had planted up almost 100 old and tired wellies as part of a project to support the 'In Bloom' campaign. The wellies are on view at the Model town until at least the end of August. Britain in Bloom Judges with North East Minster Girlguiding Group and the Planted up wellies (from the Left) Judge Ruth Growney, Paddy Cleveland, Sophie & Mia Randall, Judge Mel Henley & Debbie Randall . Mel Henley said after the judging, "it was a great pleasure to Judge Wimborne. It is fantastic achievement to reach the national finals. From over 2,000 entrants, you are in the top 78 to 80 communities and in the best 9 towns in the whole of Britain. We have been treated to lots of colourful floral displays and noted the enormous efforts made by Wimborne in Bloom volunteers to plant, tidy and fund raise. It was great to see how you work in partnership with the Town Council, the Wimborne BID, the National Trust and others. We are confident you will continue to make a real difference to your beautiful, historic town". The results of the National Judging will not be known until mid-October so please help us to keep everywhere looking clean and tidy for the sake of residents and visitors alike. For only the 6th time in Wimborne in Bloom's 26 year history the Town of Wimborne Minster has been nominated as a finalist in the Britain in Bloom Competition 2018. 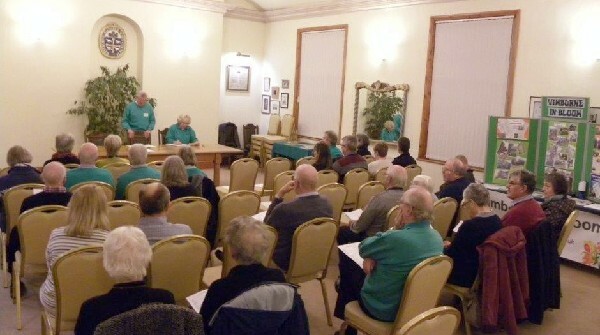 The announcement was made by Richard Nunn at the recent Annual Meeting of Wimborne in Bloom. The nomination comes as a result of Wimborne winning the Town Category in last year's Regional Competition with a Gold Award. Mr Nunn said, "Wimborne in Bloom is honoured to be nominated and look forward to the Britain in Bloom judges visit. We hope to repeat our success of 2012 when we were awarded the National Title although the additional work is not underestimated!" Last year on account of the increase in the Town's population we were entered for the first time in the Town, instead of Small Town, category and it is in this category we will be entered into Britain in Bloom. We face stiff competition from eight other Towns ranging from Linlithgow in Scotland to the City of London. The Town will be judged twice, in July in the Regional Competition and in August for the National Competition. At the Annual Meeting Mr Nunn who was re-elected as Chairman gave a report on the activities of the group in its Silver Jubilee Year (2017) and presented the accounts which showed a small surplus of income over expenditure. Each year we need to raise in excess of £18,000 to enable us to provide all the summer and winter planting throughout the main areas of the Town. He mentioned the close working Partnership which exists between the Wimborne BID, the Town Council and Wimborne in Bloom and expressed thanks to our contractor Dutch Touch for ensuring the Town had another wonderful floral display. Special thanks were given to Little Banks Nursery who have provided us with hanging baskets for more than twenty years because as they are cutting back this year they will no longer be able to supply us. We welcome our new contractor Beecroft Nurseries. 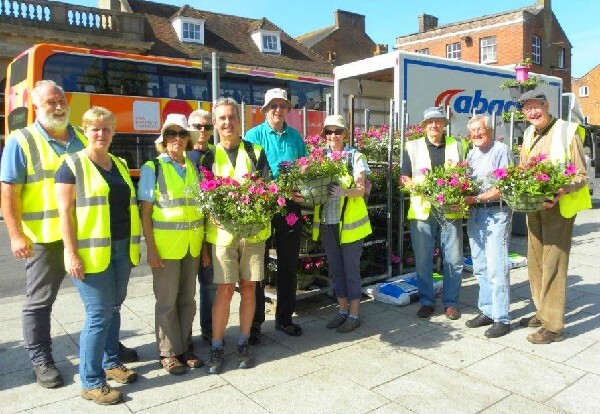 The early part of June has seen a spate of action by Wimborne in Bloom as over 190 hanging baskets and over 30 window boxes full of flowers have been put up around the Town ahead of this year's competitions. These augmented the summer planting when over 80 wooden barrel planters and flower towers were filled, all ahead of the Local, Regional and National 'In Bloom' Judging. 2018: Wed 13th June - the hanging baskets arrive supplied for the first time by Beecroft Nurseries of Merley, Wimborne with on the left Damon Corio and Lynne Birch from Beecroft and members of the Wimborne in Bloom Committee with Richard Nunn, Chairman (second from right) ahead of putting up the baskets with the additional help of the Groundsmen from Wimborne Minster Town Council. 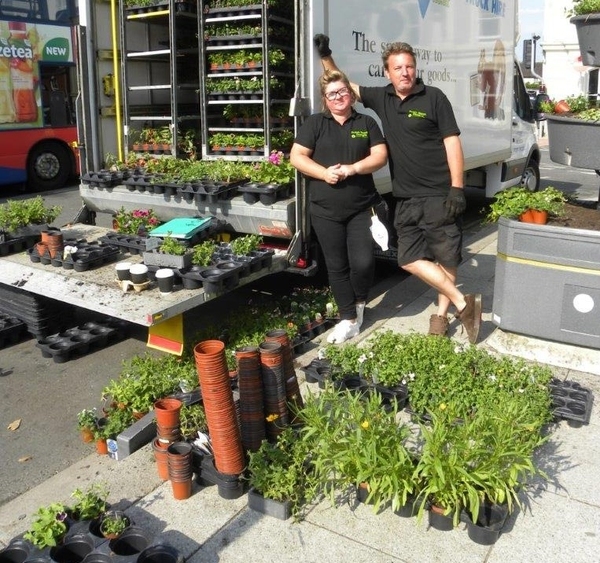 Debbie and Geoff Field of Dutch Touch relaxing before planting out the Flower Towers and planters around town. 2018: Tue 3rd July - New planters and barrels are installed in Crown Mead to enhance the attractiveness of this section of the town. 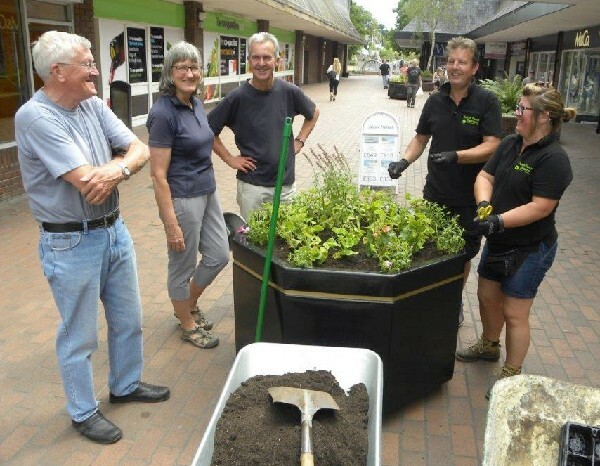 Photo shows Richard Nunn (Wimborne in Bloom chairman), Kathy & John Allen who all helped get the planters in place, along with Geoff and Debbie Field from Dutch Touch who planted up the containers and will see to the watering throughout the summer and autumn months.